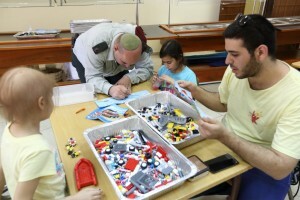 Maor Cohen is known at Ezer Mizion as the Lego Man. He runs a workshop for kids with cancer and their siblings using lego as a medium enabling them to cope with their fears and anxieties. For those children who are unable to attend the workshops he makes hospital visits. Always smiling on the outside, one cannot imagine where he finds the strength to continue his mission of chessed. Read on to share his thoughts. Throughout his youth, Cohen never abandoned his hobby. But, of course, as he matured, his focus turned to adult occupations. He served in the army, completed an officers’ course, and today, after finishing his academic studies through the army, is serving as a Major in the Manpower Department. One day, he recalls, after realizing that he had accumulated in his home an unimaginable amount of Lego, worth hundreds of thousands of shekels, he decided that it was time to pass the pieces on to somebody else who would enjoy them. “I wanted to do something good with the Lego. I turned to my friend, Rabbi Eitan Eckstein, who suggested that I donate the collection to Oranit, Ezer Mizion’s Donald Berman Rehab Center for Support of Cancer Patients and their Families. Taking a vacation from cancer. “They were so convincing that I tried giving the workshop that very day. I recall hesitantly entering the playroom with a few pieces of Lego and three children and we started building. Well, it worked. The kids loved it. Every week, the number of kids increased, and today there are almost thirty children participating. Why Lego? “First of all, Lego is great fun. I also think that it is especially important for these kids, because with Lego, there is a feeling of continuity. All that planning gives them a sense of a future. Dr. Bracha Zisser, Director of Oranit, explains that Oranit was founded in order to relieve patients and their families during the difficult period of treatments. “We operate as a guest house that enables families to sleep over in the Center of the country near treatment centers to avoid the long, grueling hours of traveling. We also organize trips and social activities. In addition, we provide many forms of therapy for both patient and his family. We are constantly expanding our activities in order to enable every person, the patient or his family member, to connect with activities that speak to him. If you’d like to join the LegoMan in his humanitarian work, just click here and type lego into the memo field. 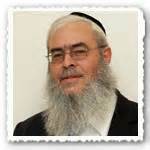 Summer is over and Yom Tov has come to an end. It’s back to the routine. Lost homework, missed busses and all the rest. For most people. As we wait outside in the rain with a shivering first grader who refuses to wear her raincoat, a neighbor looks on in envy. 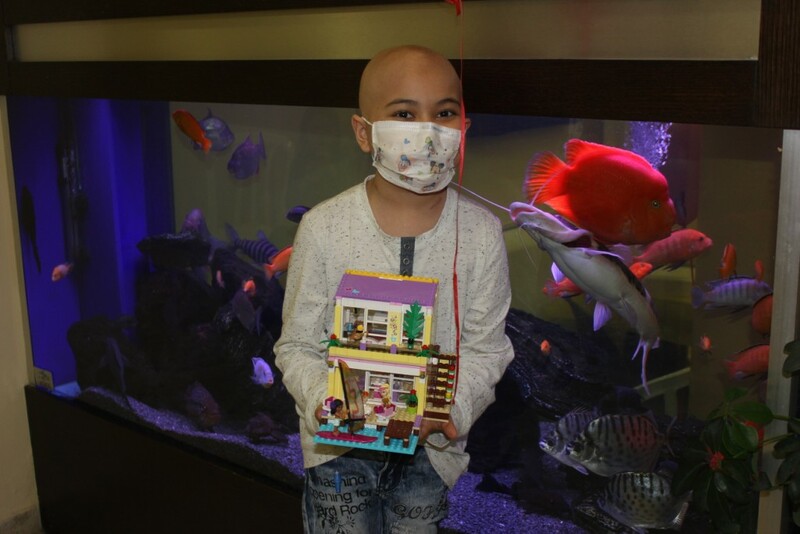 She would also like to be back to routine but her first grader is lying on a hospital bed in the oncology ward. She has her own routine: chemotherapy treatments, tests, pain, and anxiety. It’s so hard. The endless, complex red tape, the demands of the other children who cannot understand why Mommy is hardly home, the regular household needs, the emotional needs of her precious child lying so pale and wan—it’s all so overwhelming. And then there’s the fear- the terror that engulfs, the horror that crushes, the monster that you don’t want to face but it faces you and you are forced to look into its ghastly eyes, helpless. Continue reading Back to Routine? 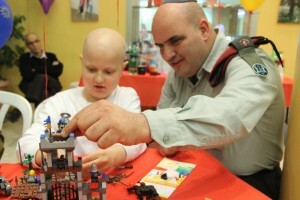 Volunteering areas: Volunteers at Oranit, Ezer Mizion’s Guest Home for cancer patients undergoing treatments at nearby hospitals (and their families). As part of a group of volunteer youth, Doriel also goes to the Pediatric Oncology Ward at Schneider to play with the patients, cheer them up, laugh, roughhouse with them, and otherwise dispel their boredom and pain. At the entrance to the Oncology Ward, the world stops. A fight for life rages in every room, in every bed. And as in war, there are many forces involved: doctors and nurses, relatives and friends, social workers, medical clowns, and more. Each one and his job, each one and his part in the battle * But hovering over them all is the “Iron Dome” of Ezer Mizion, there at the ready to intercept every challenge, remove every obstacle that appears on the way, and take care of all the auxiliary matters, so that the people fighting for their lives can focus on the battle, and with Hashem’s help, get past it safely. A hum of whispers accompanies Rabbi Chananya Chollak’s entrance to the ward. Doctors and staff members alike, parents and children, all look up to him with reverent eyes. This is the man who stands behind the two-word phrase, “Ezer Mizion,” a phrase that personifies for them the light within the darkness, the warm, enveloping embrace in rocky, frightening times. 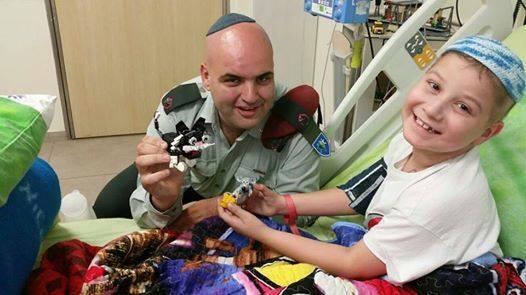 Those who recognize Rabbi Chollak quickly inform the others of the identity of the one who came in, and they too join in eying the man who stands behind all the good angels filling the ward around the clock, all in one, single goal: to help relieve the patients’ burden. A young mother discovers that the hospital has become a second home, gives birth to a younger sister who will save her older brother, and in the midst of all this — she, a settler from Kefar Tapu’ach, turns into the best friend of a mother f rom Gaza.